The ‘during your lunch break’ section of this site, focuses on those places that fit the “tourist guide for locals” criteria of being interesting, unique or iconic. 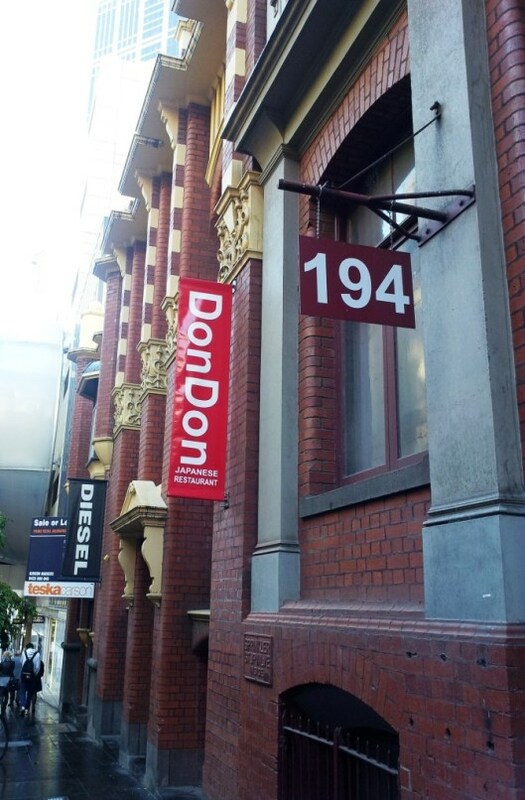 Japanese fast food store Don Don, fits well within the ‘iconic’ criterion. I am not always one to go for the hype. I have never felt the urge to rave about the various ‘best ever’ doughnut vans, I view the Huxtaburger burgers as simply okay and my limited exposure to South Melbourne dim sims hasn’t given me any great urge to go back for more. Don Don on the other hand has truly won me over. This is fast food. You will be served and have your food delivered in about the time it takes Usain Bolt to run the one hundred. A few noodle dishes, some Japanese curry, a couple of vegetarian options and a salad are your choices. I know it’s bad food review etiquette to go in guns blazing and recommend only one dish, however I am not really a food reviewer, let alone a good one and I say that you simply have to try the chicken curry (or beef/tofu if you are that way inclined). Don’t bother with anything else; go straight to the curry. The chicken is grilled to perfection, the sauce delicious, throw in some fresh ginger and crunchy broccoli and you have the best $6.95 fast food meal imaginable. At the risk of using an obscure 90s reference you could say that “is Don Don is good good. I remember I used to love the curry when they were still the smaller stall on Swanston and remember how fast it was! Yet to check out their new place.